Incontinence is unfortunately fairly common among older women in particular. If you suffer from frequent urine leaks, it is important to be aware that you don't have to merely accept this condition and learn how to live with it - there are different methods that can be tried to treat or at least alleviate incontinence. If you feel your incontinence has become damaging to your lifestyle, or you are worried about its severity, it is important to discuss the matter with your doctor. However, the following are some natural techniques that you can try at home. If you know you are prone to urine leaks, keeping a schedule with regards to when you consume drinks and void your bladder can be very helpful. The equivalent of six to eight glasses of fluid is the recommended amount you should consume each day; however, if you suffer with incontinence, it can be useful to keep an eye on when you have these. For example, drinking before bedtime may cause involuntary urination during the night. If you are consuming this amount of fluid, it is considered normal to void your bladder between six and eight times per day. If you feel the urge to go to the bathroom more often than this, try to hold it in for five minutes; in doing so, you will slowly train your bladder into storing more liquid. There several exercises that can be helpful for supporting the muscles that influence bladder behavior. The renowned Kegel exercises are especially effective in maintaining the strength of your pelvic floor muscles. They are easy to carry out at any time of day, no matter where you are. Alternatively, general body-firming activities such as yoga, Pilates, and swimming are also beneficial. It is important to maintain physical health and specifically nourish your muscles to ensure that they stay effective in controlling your bladder and other bodily functions. 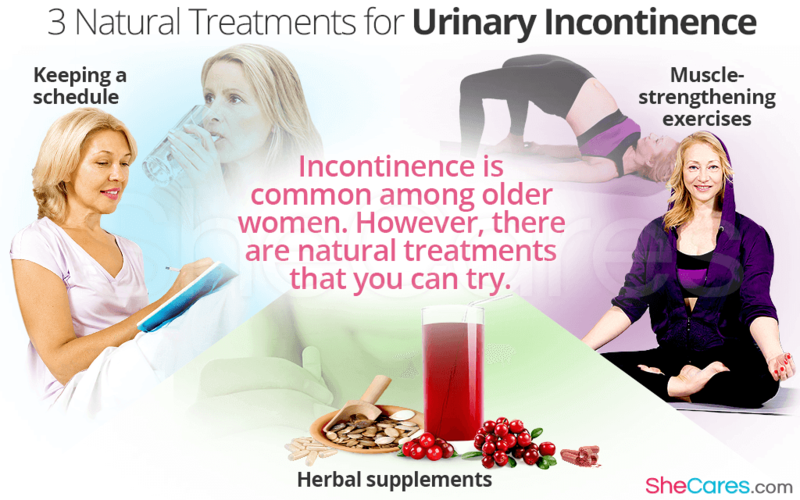 Depending on the cause of your incontinence, there are various natural remedies that can be taken to lessen the frequency of urination. One of the most common reasons for frequent urination is because of a urinary tract infection. If this is the case, many herbalists recommend cranberry juice or supplements for managing the condition. Another option is pumpkin seeds. Studies have revealed that these are effective in treating disorders relating to the urination process, such as an overactive bladder. Both cranberries and pumpkin seeds are safe to consume in moderation as part of a varied diet. Addressing an incontinence problem can be troubling, but it is important to know that there is a plethora of options out there regarding how to cope with it. Similarly, many women find it is helpful to understand the reasons why incontinence presents itself, especially in women who are approaching menopause or finished with the transition.